Sinusitis symptoms can be misleading. I have seen many patients come into my office thinking they had a toothache, when they actually had sinusitis. And it can happen the other way around; you might think you have sinusitis, when it's something else entirely that just feels like sinusitis. Finding the best cure for sinusitis or a pain that feels like sinusitis depends on finding out the exact cause. We have to identify the CAUSE of your sinusitis symptoms before we can start to think about the best treatment! And just because you have symptoms of sinusitis, it doesn't mean that you ACTUALLY have a sinus infection. Teeth grinding is one of those things that can give you sinusitis symptoms. The strain caused by the jaw muscles when clenching at night can actually bend the thin layers of bone around the sinus, causing irritation to the lining, and triggering ALL the sinusitis symptoms that you get from an infection with bacteria or a virus. It's really weird, and it can be VERY MISLEADING. You can read more about the symptoms of teeth grinding at Grinding Teeth Symptoms. There are a couple of points to look for when deciding if a pain in your face is caused by a true sinusitis or by teeth grinding. Obviously, there's no point in taking sinusitis antibiotics if there are no bacteria in the first place! Antibiotics are only effective against bacteria. People generally think that sinusitis symptoms are similar to getting a cold. Maybe your nose runs, you feel like your head is "blocked up", you might have earache too. But it's more complicated than that. There are basically two types of true sinusitis, as well as the "fake" sinusitis caused by tooth grinding. A general ache in one cheek, below or around the eye; sometimes (rarely) both sides of your face are affected. The ache comes on (or gets worse) when you lie down. The ache is worse at night (also when you are lying down). If you get up in the middle of the night and walk around for a bit, the ache eases off. 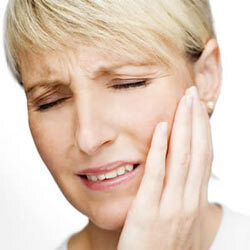 You feel like you have toothache in several upper teeth, especially the back teeth. They can feel tender to bite on. You might feel an ear ache on the same side of your head. Sometimes the vision in one eye can be affected. A "post-nasal drip" - this is where you feel like there is a more or less constant bit of mucous or phlegm at the back of your throat, making you want to swallow all the time. It feels like it's dripping from the back of your nose into your throat. As a dental student I was also taught that you can get a yellow-green discharge from your nose. In 30 years of working as a dentist, I've never seen this. Maybe people with sinusitis that bad go straight to the doctor, I don't know. What is causing these sinusitis symptoms? If it's a true sinusitis, it's an infection inside the little air cavity in the upper jawbone just under your eye. It can be caused by bacteria or by a virus. The difference is important, since bacteria can be treated with sinusitis antibiotics, whereas a virus is not affected by any antibiotics. In a true sinusitis, infection leads to inflammation inside the little cavity. The thin membranes lining the sinus swell up, sometimes blocking the tiny tubes that normally connect your sinus to your nose and ear. Then you can get a fluid build-up inside the sinus, leading to increased pressure. Imagine you accidentally hit your thumb with a hammer. It would swell up, as it became inflamed and your body's immune system tried to repair the damage. Your thumb would ache. It's the same inside your sinus. The infection triggers the body's immune reaction, causing swelling and inflammation. This is what causes the ache. Sinusitis caused by a virus often develops very quickly. In total, it usually lasts for less than 4 weeks. In most cases the symptoms begin to settle down within a week, without any treatment. This is very fortunate, because sinusitis antibiotics don't have any effect on a virus! Sinusitis caused by bacteria is usually a bigger deal altogether. It comes on more gradually, maybe starting as a result of a normal cold. It is less likely to clear up on its own. It may even lead to a long-standing low-grade sinusitis, or to the infection spreading beyond the sinuses. A nasal discharge that lasts for more than 10 days is usually a sign of sinusitis caused by bacteria. These bacterial infections may be difficult to treat. 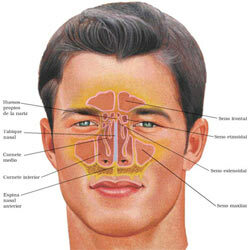 The established sinusitis cures are based on antibiotics. The best sinusitis antibiotics are Amoxycillin, Doxycycline, and perhaps Erythromycin. An older antibiotic that is still sometimes used is Trimethoprim-Sulfamethoxazole (Bactrim). You can also take a decongestant medicine to help relieve the congestion in your nasal passages that is usually associated with sinusitis. As well as making you a bit more comfortable, the decongestant actually allows for a better blood supply through the area and therefore allows your own immune system a better shot at dealing with the bacteria or virus involved. You can normally buy decongestant medicines over the counter at your pharmacy, without a prescription. Just make sure you follow the recommended dose! They usually contain the active ingredients pseudoephedrine, dextromethorphan and chlorpheniramine. If your sinusitis symptoms are not cured after two or three different sinusitis antibiotics, you should talk with your doctor about surgery or allergy testing. A long-standing sinusitis can sometimes lead to permanent changes in the membranes that line the sinus, making you more likely to getting sinus infections again in the future. you will tend to have the pain when you wake up, or get it soon after waking, rather than when you lie down to go to sleep. you may have pain or discomfort down the side of your lower jaw, rather than around your eye. you might feel that some lower teeth are tender to bite on, rather than the upper molars. you could have a pain in your head right at the front, in the middle, and at the back of your head too. Try clenching your teeth. Keep the pressure on. Now reach up and press your fingers firmly into the sides of your head, just above and in front of your ears. You may have to press quite hard. If it's painful when you press, your "sinusitis symptoms" are likely down to teeth clenching. If not, it's probably a true sinus infection. In this test, you are pressing into one of the major muscles that gets stressed by night-time tooth clenching. That leaves it tender. It is usually sensitive to firm finger pressure when you are pressing your teeth together tightly. signs of excessive wear on your teeth, especially the "eye teeth"; ("canines" or "cuspids"). little bony lumps under your tongue that can develop as a result of years of clenching your teeth. Enlarged muscles around the corners of your lower jaw, under your ears. The racing driver David Coulthard is a great example! you might suffer from "restless legs", particularly when trying to fall asleep. This is because clenching your teeth when asleep is actually classed as "a movement disorder of sleep". The so-called "restless legs" is also classed as a movement disorder of sleep. Carefully looking at your symptoms will give you the correct sinusitis cures, whether it's sinusitis antibiotics or a small splint to stop you grinding your teeth. But it's not always easy nor quick to spot the difference. Just taking sinusitis antibiotics without getting checked is unlikely to help! You need to see a dentist who knows about the possibility of your sinusitis symptoms being caused by tooth clenching or grinding while asleep, and get him to check everything. Diving blindly into sinusitis cures without getting checked is NOT a good idea! You can read some more information about the link between sinusitis symptoms and tooth grinding HERE.